Bring this Safavieh Courtyard area rug into your dining room for an easy splash of style. Great quality is assured with this indoor/outdoor piece made out of plush synthetic material. This rug is machine-made for convenience and quality combined. You and your guests will enjoy the lovely geometric pattern that decorates this green rug. Trendsetting and innovative textured weaves set the Abstract collection apart from the rest of the pack. With a multi layered look and feel, lyrical lines and soft geometrics, this collection creates a visual panorama. A subtle palette of subdued creams, indigo and grays accentuate each pattern, creating pieces that blend well into todays fashion-forward decors. Chic and charming, the style of our Foliage Friends design is like a breath of fresh air to the mundane rugs of the world. Floral inspired medallions pop in a rich array of stunning colour options. This rug is quality constructed with Mohawk Home's exclusive Weardated nylon, designed specifically to resist staining and crushing in high traffic areas of the home. Available in three colourations, blue, warm and garden. Courtyard Alex Green / Beige 6 ft. 7 inch x 6 ft. 7 inch Indoor/Outdoor Square Area Rug Bring this Safavieh Courtyard area rug into your dining room for an easy splash of style. Great quality is assured with this indoor/outdoor piece made out of plush synthetic material. This rug is machine-made for convenience and quality combined. 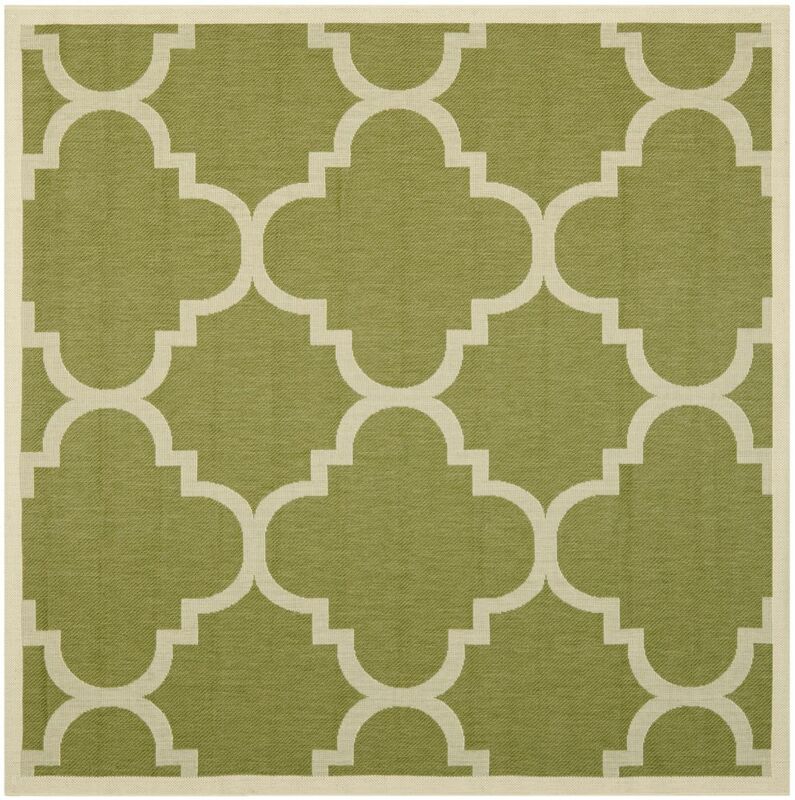 You and your guests will enjoy the lovely geometric pattern that decorates this green rug.